The latest, highly-anticipated endeavour by INK Entertainment and ICON Legacy Hospitality is set to open next week. Here’s a preview. NAO Steakhouse officially opens on November 24th and what makes it exciting is that it’s part of the successful group behind some of Toronto’s most popular trendy hotspots such as LS Bistro (La Societe), Patria, Weslodge, and Byblos. Partners involved in NAO Steakhouse include Charles Khabouth, Hanif Harji, and Tim Foley along with Chef Stuart Cameron (who’s also the Executive Chef at Patria, Weslodge and Byblos). 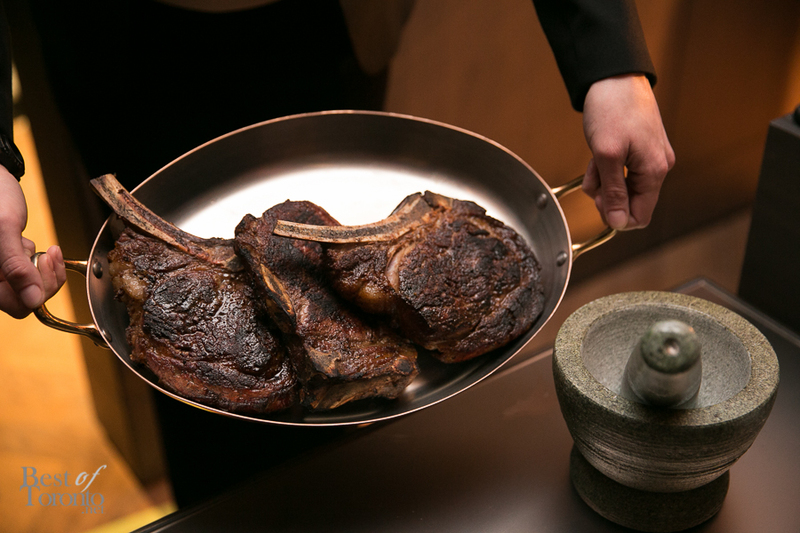 NAO stands for “New and Old” and this modern steakhouse takes elements from both new and old. 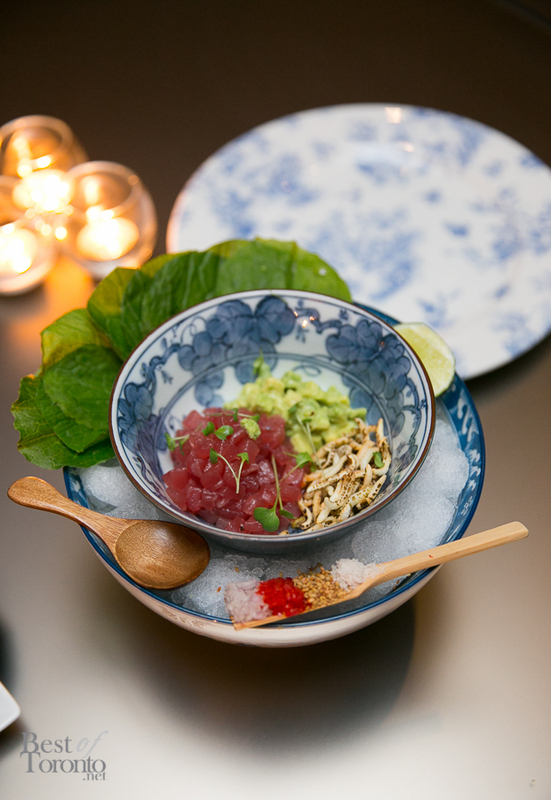 So this is not just another classic steakhouse, but it takes inspiration from fine Japanese palettes with menu offerings such as tuna tartare with wasabi and puffed rice on a wasabi leaf. At the preview event there was a state-of-the-art carving station serving premium cuts of meat including USDA Prime Beef, dry-aged for a minimum of 40 days, Porterhouse and bone-in Rib Eye, Big Bluestem and wheat-fed, pasture-raised beef (30-day dry aged) as well as pasture-fed David Blackmore’s full blood MS 9+ Waguyu beef. The steak was sampled at the preview event on November 13th were incredibly delicious and tender. Traditional steak cuts are treated to Asian-Pacific influences in the form of shiitake mushrooms barrel-aged in soy sauce, yakatori-grilled baby yellow corn basted with house-made miso butter, crispy homemade tofu coated in ground chorizo and red bean paste sauce, and baked potatoes cooked in Wagyu fat. We’re told that as part of the exclusive NAO experience, a variety of special large cuts of meat will be carved table-side including a bone-in USDA prime Chateaubriand which serves two. You can also select your choice of special salts. 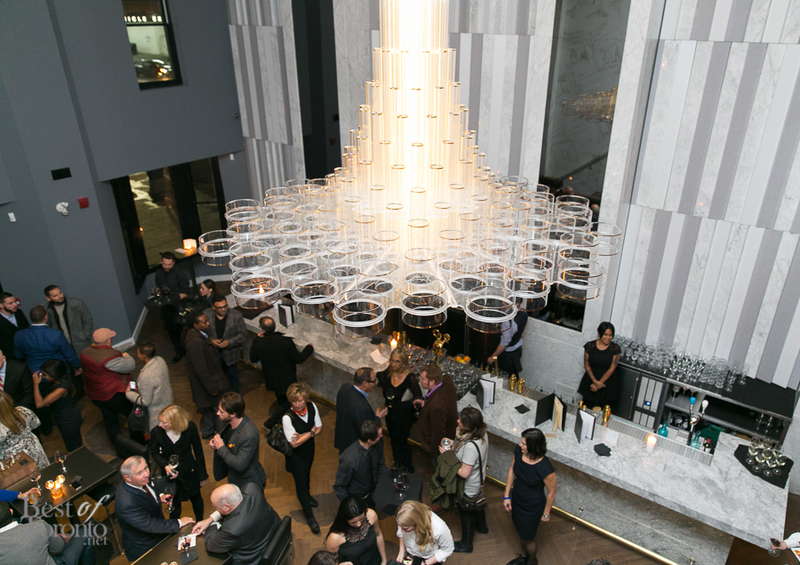 This large two-storey establishment on Avenue Road in the Yorkville area features soaring 22 foot ceilings, a grand 9 foot chandelier, two shades of walnut and marble and granite throughout, gorgeous one-of-a-kind mirrored panels, Italian leather lounge seats, as well as brushed bronze trim. 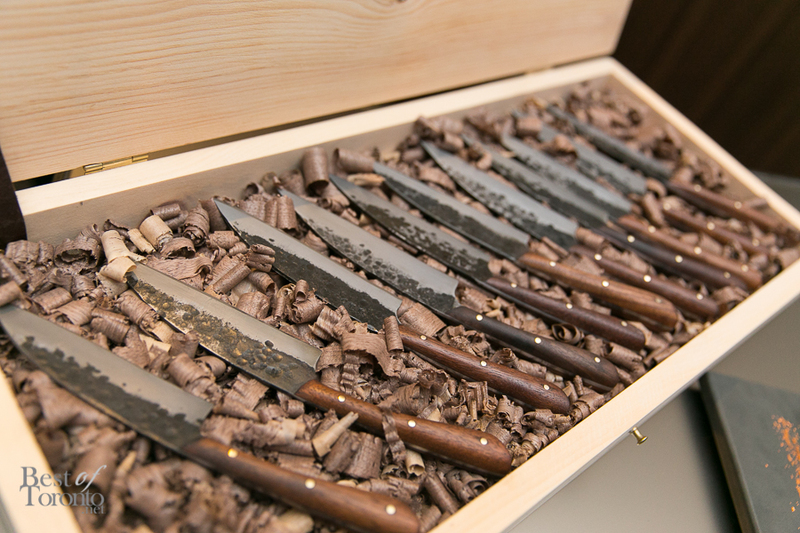 More fine details were considered such as the custom steak knives were individually forged by hand by local blacksmith Frederick Scanlen.